The Australian Ballet have launched their Season 2014, and I must admit, I’m pretty impressed. I’m sure I’ll have my subscription renewed for next year before I see La Sylphide on Friday night (not to mention Cinderella in a few weeks)! There are a couple of things lined up that I have seen before, but I am actually quite excited to be seeing them again. The 2014 Season will begin with Sir Kenneth MacMillon’s Manon, which was the first ballet I ever saw. I would not recommend Manon for ballet-beginners, as it is quite a case of jumping in the deep end and discovering you’re not sure if you can swim, but I did enjoy it when I saw it (five years ago now! Blimey time flies!) despite not having the foggiest as to what was going on in either the storyline (cue constant consultations with the programme) or the dancing. I am happy to say that now I am a much more seasoned ballet attendee, as well as having nearly four years of ballet classes up my sleeve, when I see Manon early next year, I’ll actually ‘get’ it! This is the same production of Manon as used by the Royal Ballet and a number of other companies, and it is stunning. I have been hanging out for the Australian Ballet to put it on again, and now my ‘first’ ballet will also become my ‘first production second’ (vis: first ballet that I see the same production of a second time). There will then by a classical double bill consisting of George Balanchine’s Ballet Imperial and Serge Lifar’s Suite en blanc. I saw Suite en blanc in the Australian Ballet’s 2009 Season in a double bill alongside Divergence, and I remember it as being very pretty. That was actually the second ballet I saw after Manon, so it’s quite a coincendence that it will be my ‘second production second’ ballet. I haven’t seen Ballet Imperial, but from the few seconds from it in the preview video, it looks like it will be a fantastic showpiece. And I love a good tutu showpiece. Chroma is a contemporary production. I’m not sure that this will be included in my subscription package, and, if not, I can’t admit to be particularly worried about missing it. There will also be Bodytorque: DNA in Melbourne, the first time the Bodytorque series has been brought to Melbourne. Again, I’m not that interested, but each to their own. Season 2014 also includes the Australian premiere of Stanton Welch’s La Bayadere. I’ve not seen this ballet either, and am looking forward to it. It has sumptuous production design and looks great in the video, so it should be good. Finally, back by popular demand is Sir Peter Wright’s The Nutcracker. This will actually be the third time I’ve seen The Nutcracker, the second time with this production, and once at the Royal Ballet in London. This production is the version that Sir Peter did for the Birmingham Royal Ballet, and it differs in design and slightly in choreography to the Royal Ballet (Covent Garden) version. When I saw The Nutcracker with the Australian Ballet it was good, but nothing overly special (and unfortuneately the first act was ruined for me by the small child sitting next to me whole spoke through the WHOLE thing, and her mother would reply to everything she said, then say ‘shhh’. I could have strangled them both). However, Lana Jones was just so amazing as the Rose Fairy in the Act II Waltz of the Flowers (she received a larger applause at the end of the show than either Clara or the Sugar Plum Fairy), that she managed to redeem the show for me. The Nutcracker with the Royal Ballet in Covent Garden, however, is the best ballet I have ever seen, and I have never experienced anything like the electricity in the Royal Opera House during the Act II Pas de deux. I love the Tchaikovsky score, I love the magic and the Chirstmasness (though this will probably be in Melbourne in September) and this whole ballet in general. So I really hope this will be good. Good things are coming for the Australian Ballet’s Season 2014. This could be just another feel-good story about old blokes out playing sport and having a good old time representing their respective countries in a match of cricket between (friendly) rivals Australia and England. And it is. However, it’s a lot more than that, because one of those fantastic old blokes was my sport teacher at school in Years 7 and 8. Mr Dunn has been teaching at my school forever (he was teaching there when my mum was there back in the late ’70’s/early ’80’s), and he still teaches sport today, as well as representing the country in cricket. Mr Dunn’s wife Pam is interviewed in the video (nor the picture above), and while old Dunners himself isn’t, he does feature in a few clips; he’s a skinny bloke with a beard and a full head of hair. Mr Dunn is a proper legend (even one of the houses at my school is named after him (all the rest are after old nuns and bishops!)). The Aussie Masters Cricket Team may have lost their ‘Ashes’ tour, but so did our ‘proper’ First XI, so it doesn’t matter. Good on you, chaps, battling the old enemy. Before anyone gets excited, no, I am not at this game. I am merely watching it on TV, although, now that I see it, it would be rather brilliant to be there. This match is a friendly between the famous Liverpool FC and the not-so-famous Melbourne Victory, which is one of the top teams in the A League (Australia’s Premiere Football/Soccer League). The game is being played at the MCG (Melbourne Cricket Ground – home of the Boxing Day Test match and main stadium for the 2006 Commonwealth Games, and, back in the day, when it looked entirely different, the 1954 Olympics, not to mention AFL). 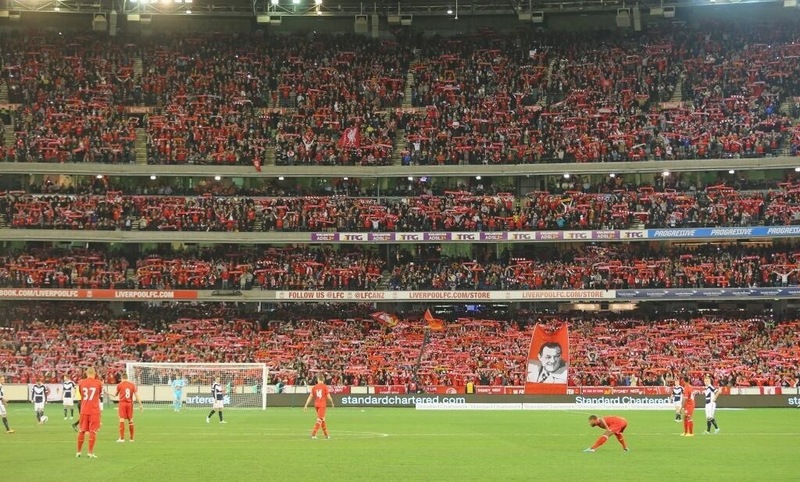 The MCG holds 100,000 (official number: 95,446) people and it is FULL, and by all reports, it’s 100,000 Liverpool fans. That’s one of the strange things about Australians, or perhaps just my household: we don’t follow the A League, and only ever see the highlights of the British/European leagues, but put Liverpool in Melbourne, against the Melbourne team, and my goodness, we will support Liverpool the whole way!! The reason I’d most like to be at the game is for the atmosphere. The crowd is SO loud, and singing and chanting: Australian sport crowds just don’t do that! But the atmosphere, especially in the dying minutes was just phenomenal. Also interesting to see British ads at the MCG (for Standard Chartered and Continental). Final score: Liverpool 2:0 Melbourne Victory. In the last seconds MV scored an own goal. Duds. This is one of the many recipes from Jamie Oliver’s Great Britain cookbook that I absolutely love. 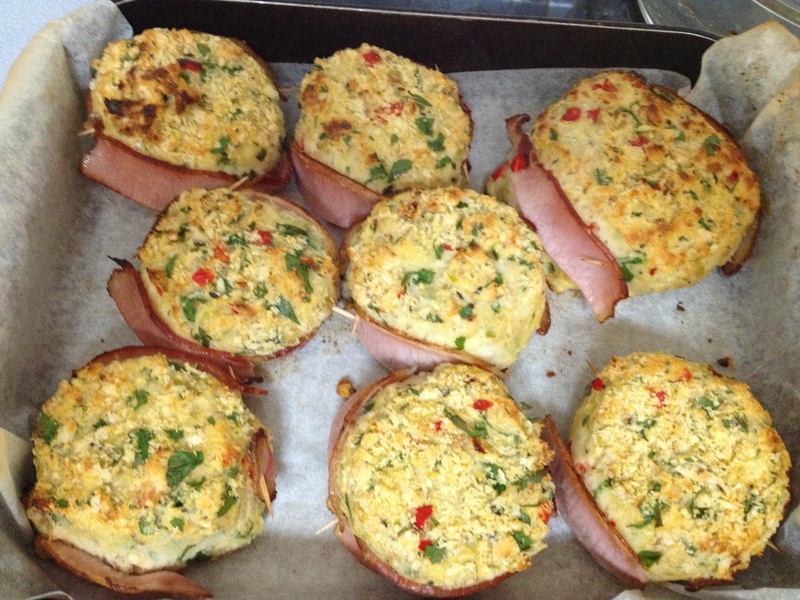 These fishcakes look so fancy and restaurant-esq, but, despite having a number of steps, are quite easy to make. And the results are most impressive. I made a couple of adjustments to the recipe, mostly using a fresh chilli instead of dried, and using a tin of smoked salmon, rather than fresh. 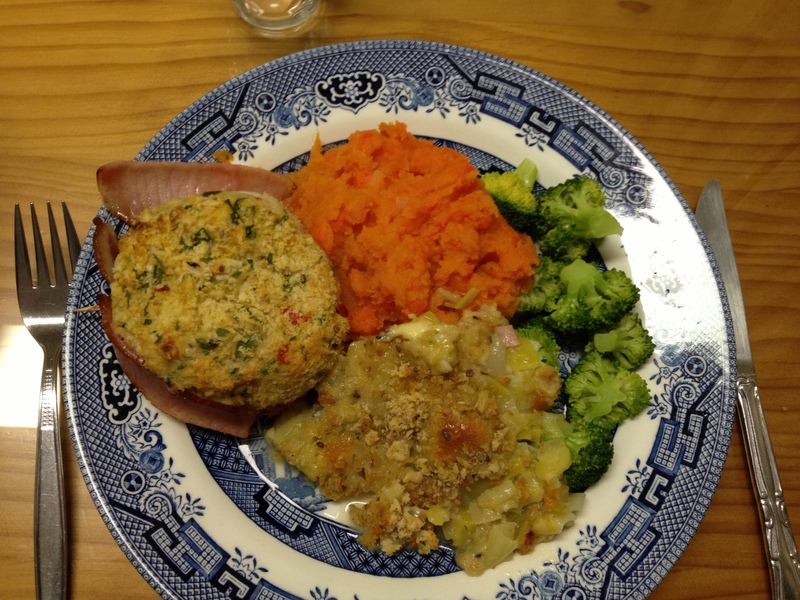 I served these fishcakes with the Creamy Leek Gratin, also from Mr Oliver’s Great Britain cookbook, some boiling broccoli and orange mash (sweet potato and carrot, peeled, chopped and boiled until soft. Drained. Knob of butter, good pinch of salt and pepper. Bit of nutmeg. Mash. Serve). I’ve not transcribed this recipe, partly because it’s very long, partly because I highly recommend buying this cookbook, and it defeats the purpose if every recipe can be found online!